A kaleidoscope of traditions, culture, and vibrant geographies, India speaks for itself as a soul-stirring journey. From its dusty snow trenches, frolic coasts, gripping natural green to the mystic ravines of spirituality and clusters of cultural shades defining the raw beauty, India captures the heart of every tourist. In addition, a variety of festivals, lively markets, vibrant lifestyle, and traditional Indian hospitality, will make your experience as an India tourist truly unforgettable and fantastic. Understanding this global demand and the potential of the tourism industry to bring in more revenue, the government of India introduced ETVs (Electronic Travel Visas) because of which it became easy to get Indian E-Tourist visa for UAE citizens. Is it possible for UAE citizens to get a visa on Arrival at the airport? Like most of the other countries India too replaced the existing visa on arrival system with ETVs. It takes around 2-4 days to apply for an E-Visa and get it approved so applying from the airport after arriving in India is not possible. Effective November 2015 foreign nationals who arrive at any Indian airport without a valid visa will immediately be deported to their country of origin. It has been made mandatory for airlines flying to India to make sure that passengers flying to India hold a valid visa. How long does it take for UAE Citizens to get an E-Tourist visa? The government website says you need to apply at least 4 days prior to your journey to India. We suggest you apply 10 days prior to your journey. foreigners on E-Tourist visas can avail double entry benefits.T he visa is non-extendable and non-convertible. What should I do once I have received my E-Tourist visa by email? You have to take a printout of the document and keep it with you throughout the time you stay in India. At the immigration checkpoint, you will have to show this printout to the immigration officer for verification along with your passport. Once the verification is done your visa will be stamped and your biometric information will be taken. After obtaining an Indian visa is there is any time limit to enter into India? No, there is no time limit to enter into India, Indian E-Visa is valid for 60 days from the day of arrival in India. What is the validity of Indian Electronic Travel visa (ETV)? Indian E-Tourist visa is valid for 60 days from the date of arrival in India. For visas with longer validity and multiple entry benefits, you should apply for a sticker visa which is valid for up to a period of up to 10 years. Sticker visas cannot be applied online. How much does it cost for India E-Tourist visa for UAE citizens? It costs UAE citizens around Dhs184 for Indian E-Tourist visa. Banks charge 2.5% service charge on the applicable e-Visa fees. 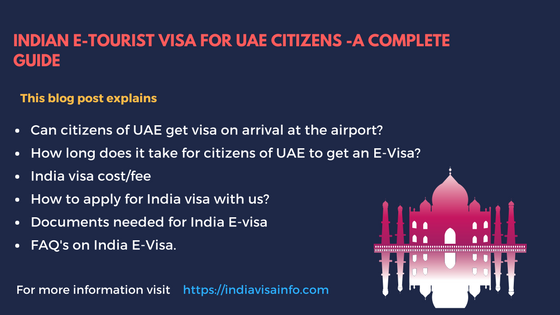 What are the requirements for India E-Tourist visa for UAE passport holders? You also need to keep all the details of your parent’s passport and your work-related information handy. You will need these details when you apply. Your passport must be valid for at least 6 months with at least 2 blank pages for stamps. In short, make sure that you cover all the points mentioned below. Your sole objective of visiting India must be for recreation (sightseeing or tours) or casual visit to see friends or relatives. (Remember that E-Tourist visa is NOT valid for employment purposes and NGO/volunteer activities. If you’re a journalist or if you’re visiting India for a conference, there is a separate visa for that which you can apply directly for at an Indian Embassy). Is it easy for UAE citizens to apply for India E-Visa? The claims of the process of application for Indian E-Visa becoming easier remains only in paper. The visa application portal is one of the abysmal portals one can ever find on the web because the servers are poorly maintained. This leads to the website becoming very unreliable. Chances of the website becoming unresponsive when one is about to finish applying are very high. The major problem which almost every tourist face is with the dreaded payment problem . The banks are not able to accept any payment online without any hindrance. You only get to try a maximum of three times, failure to make a successful payment in three attempts will result in your application ID being blocked. Once your application ID is blocked you have to start applying from the beginning again. You can avail our service if you want someone to handle your visa application with absolutely no hassle. All you will have to do is fill in the below application form. If I only want your assistance in making the payment against my visa application do I get a discount ? Our service charge for making only the payment against the visa application is $25, we give a discount of 50%. Foreign nationals can avail E-Tourist visa for a maximum of two times in a calendar year”(From January to December). Foreign nationals who require a visa with longer validity and multiple entry benefits should apply for a sticker visa. ETVs are also valid for entry at the following three seaports: Kochi, Goa, and Mangalore. In addition, separate immigration desks and help counters are set up to assist medical tourists at Delhi, Mumbai, Kolkata, Chennai, Bangalore, and Hyderabad airports. How long does it take you to confirm my order and get my Indian E-VISA once I place the order? Once you place an order with us our agents will call you within 12 hours to collect the required information. We will apply for your E-Visa after we get all the necessary documents and details from you. You will need to give us a minimum of 2 working days to procure your E-Visa.